Jay Weaver, “Accused airport shooter Esteban Santiago said he chatted online with jihadis,” Alaska Dispatch News, January 17, 2017, https://www.adn.com/alaska-news/2017/01/17/airport-shooter-esteban-santiago-visited-jihadi-chat-rooms-online-prosecutors-say/. “Esteban Santiago Identified as Fort Lauderdale Airport Shooter,” NBC New York, January 7, 2016, http://www.nbcnewyork.com/news/national-international/NJ-Shooter-Esteban-Santiago-who-was-fort-lauderdale-409914655.html. Caroline Linton, “Esteban Santiago-Ruiz: What we know so far about the suspected Fort Lauderdale shooter,” CBS News, January 6, 2017, http://www.cbsnews.com/news/esteban-santiago-ruiz-fort-lauderdale-airport-shooting-suspect/. Nathaniel Herz, Chris Klint, Suzanna Caldwell, and Jerzy Shedlock, “Esteban Santiago, the suspect in Florida Airport shooting, was an Anchorage resident,” Alaska Dispatch News, January 7, 2017, https://www.adn.com/alaska-news/crime-courts/2017/01/06/suspect-in-florida-airport-shooting-has-same-name-age-as-anchorage-man/. 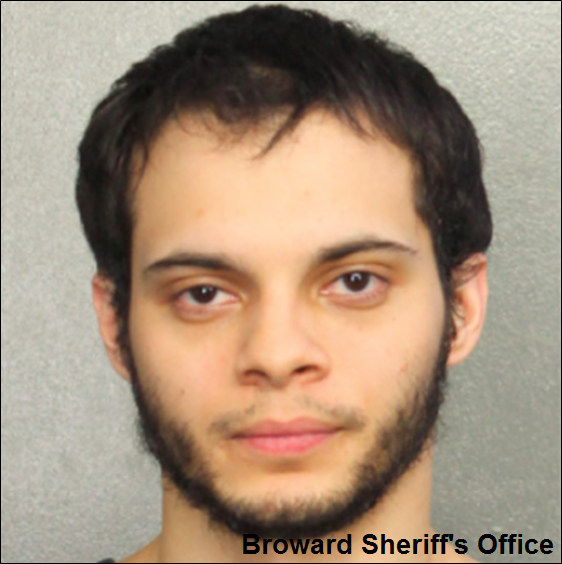 Santiago received a general discharge from the Alaskan guard for unsatisfactory performance.Caroline Linton, “Esteban Santiago-Ruiz: What we know so far about the suspected Fort Lauderdale shooter,” CBS News, January 6, 2017, http://www.cbsnews.com/news/esteban-santiago-ruiz-fort-lauderdale-airport-shooting-suspect/. According to the Pentagon, Santiago had gone AWOL (absent without official leave) several times during his time with the Alaskan National Guard and was previously demoted.Caroline Linton, “Esteban Santiago-Ruiz: What we know so far about the suspected Fort Lauderdale shooter,” CBS News, January 6, 2017, http://www.cbsnews.com/news/esteban-santiago-ruiz-fort-lauderdale-airport-shooting-suspect/. Ray Sanchez, “What we know about the Fort Lauderdale airport shooting suspect,” CNN, January 7, 2017, http://www.cnn.com/2017/01/06/us/fort-lauderdale-airport-shooting-suspect/index.html. He also received two minor offenses in 2015 of having no proof of insurance, as well as a taillight violation.Ray Sanchez, “What we know about the Fort Lauderdale airport shooting suspect,” CNN, January 7, 2017, http://www.cnn.com/2017/01/06/us/fort-lauderdale-airport-shooting-suspect/index.html. According to Santiago’s relatives, his behavior appeared peculiar ever since he returned from his deployment in Iraq in February 2011. His aunt told CNN that “his mind was not right,” and that “he seemed normal at times, but other times he seemed lost.”Ray Sanchez, “What we know about the Fort Lauderdale airport shooting suspect,” CNN, January 7, 2017, http://www.cnn.com/2017/01/06/us/fort-lauderdale-airport-shooting-suspect/index.html. She revealed that Santiago “talked about all of the destruction [in Iraq] and the killing of children. He had visions all the time.”Ray Sanchez, “What we know about the Fort Lauderdale airport shooting suspect,” CNN, January 7, 2017, http://www.cnn.com/2017/01/06/us/fort-lauderdale-airport-shooting-suspect/index.html. According to Santiago’s brother, Santiago had requested medical help from the Army and federal agencies after his deployment, and was hospitalized for several days.Ray Sanchez, “What we know about the Fort Lauderdale airport shooting suspect,” CNN, January 7, 2017, http://www.cnn.com/2017/01/06/us/fort-lauderdale-airport-shooting-suspect/index.html. According to authorities, Santiago admitted to planning the attack and purchasing a one-way ticket to Fort Lauderdale.“United States v. Esteban Santiago Ruiz,” United States District Court for the Southern District of Florida, January 7, 2017, https://www.justice.gov/usao-sdfl/file/923466/download. Esteban Santiago RuizCaroline Linton, “Esteban Santiago-Ruiz: What we know so far about the suspected Fort Lauderdale shooter,” CBS News, January 6, 2017, http://www.cbsnews.com/news/esteban-santiago-ruiz-fort-lauderdale-airport-shooting-suspect/. Esteban Santiago is a U.S. citizen and alleged ISIS sympathizer who on January 6, 2017, carried out a gun attack at Florida’s Fort Lauderdale-Hollywood International Airport, killing five people and wounding six others. 1/6/2017: violence at an international airport, et al.